Dumplings are a truly multicultural food. Broadly speaking, they include the unfilled potato and bread dumplings that are added to soups and stews in Germany and Eastern Europe. There are also the pastas of Italy gnocchi, orrichette, penne, even spaghetti if you ignore its shape. In Asia unfilled types could include rice noodles. Of course, that is only if you define dumplings as a sort of manufactured starch that would have been used by peasants to make food go further. The word ‘dumpling’ would, in most people, immediately make them think of food that ‘sticks to the ribs’. Dumplings are generally either boiled, steamed or fried. Dumplings hit new heights when they are filled. Think pelmeni from Russia and Siberia, ravioli, tortellini, agnolotti from Italy. There is gyoza from Japan, xio long bau and sui mai from China. 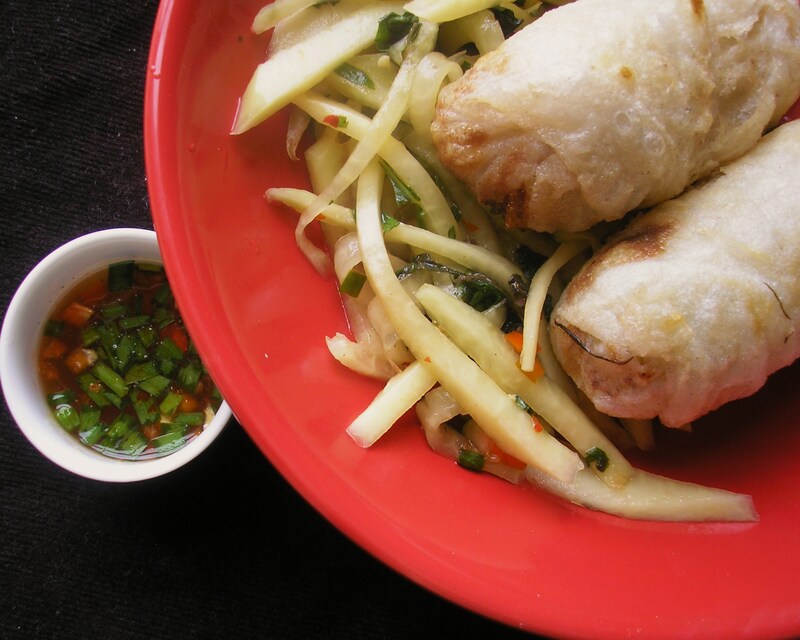 Even spring rolls fromVietnam could be seen as a type of deep fried dumpling like won tons. When I was in Footscray the other day I dropped into Little Saigon, a wonderful Vietnamese supermarket overflowing with fresh and relatively cheap Vietnamese ingredients. I picked up some garlic chives, three types of mint, some fresh coriander, bean shoots, birds eye chillies, lemongrass and a green papaya. From my local butcher and Asian grocer I added some pork mince, rice vermicelli noodles, thick rice paper sheets, gyoza wrappers and limes. From all of this I made a sort of general purpose pork mince filling suitable for dumplings or spring rolls. Mix all ingredients together. Marinate in a covered bowl in the fridge for at least two hours or overnight. When ready to use finish with some more chopped fresh garlic chives, chopped fresh herbs, a dash of fish sauce and a squeeze of lime juice. My son and I used some of this mixture to make gyozas for our lunch. These are actually a Japanese ‘pot sticker’ dumpling and I know the filling leans more towards Vietnamese cuisine but it didn’t really matter. We steamed the filled skins for 15 minutes and then browned them on on one side in a frying pan. To the mixture that was left I added a half a dozen chopped raw prawns to make a filling for Vietnamese spring rolls. 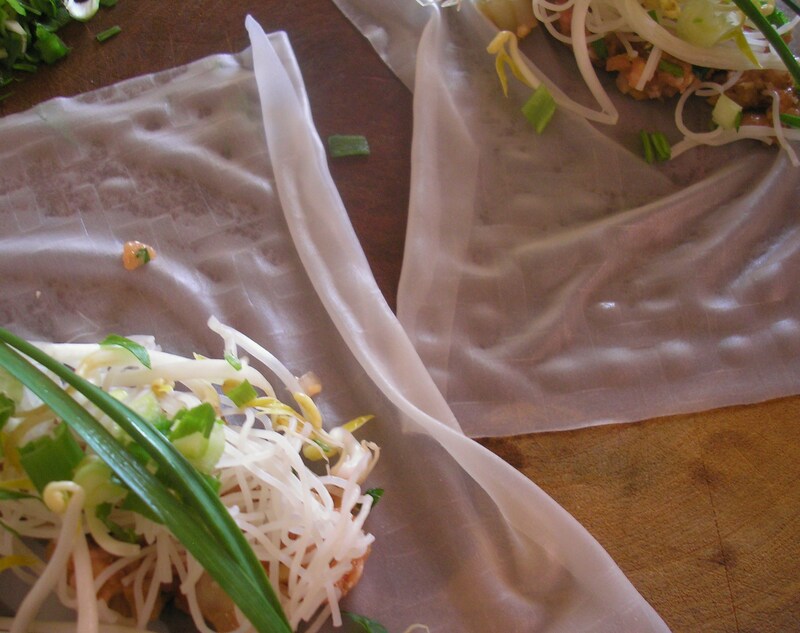 Soak the rice paper sheets in warm water a couple at a time. This should only take about thirty seconds. Fill with a little of the pork mixture, topped with some vermicelli noodles, bean shoots and I put a garlic chive (you could use a piece of split spring onion or a fresh mint leaf) on top to make it look pretty. Turn over the edge nearest to you and start rolling, folding in the edges when you get half way up the sheet. Because these ones are going to be deep fried try to make sure they are really well sealed. If in doubt it is all right to wrap with a second sheet, just remember you will need more sheets and you may need to let the rolls rest on your board fro 20 minutes or so to dry them out a bit. I then deep fried them in batches in hot oil. They took about ten minutes or until they start to lightly brown (don’t expect them to go as brown as ordinary spring rolls, just make sure they are crisp). Drain well on a rack. This 1978 spoof of 1950s B grade schlock horror films had a ridiculous plot in which killer tomato plants turned on humanity. The plot seemed very far fetched at the time but, with the recent high prices and low quality of tomatoes in the fruit shops and supermarkets, it no longer sounds so implausible. We all know that awful, fibrous, tasteless fruit that they sell as ‘gourmet’ tomatoes in the supermarket. 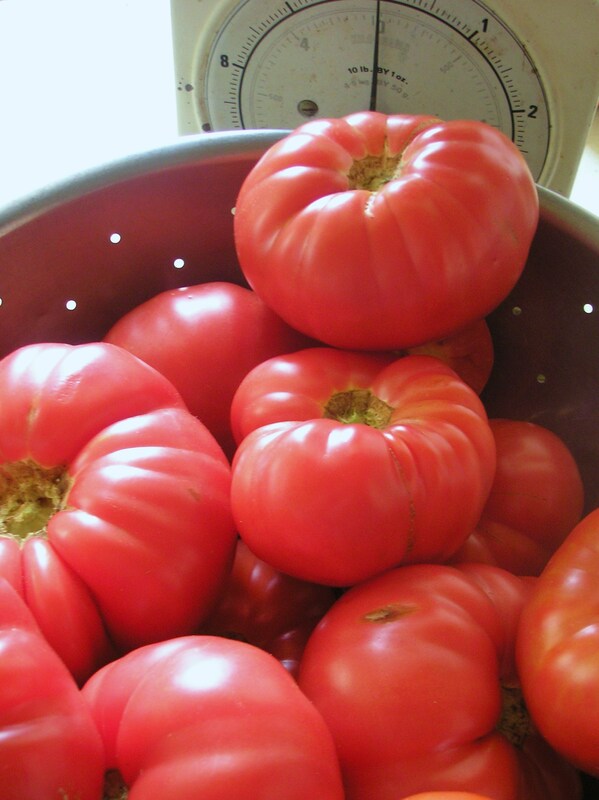 Even if you shell out a bit more for the ‘truss’ or Roma ones they are still vastly inferior to the homegrown tomatoes that I remember from my childhood. The other day I was down at my parent’s place on the Bellarine Peninsula. We had our usual lunch sitting in the garden looking out over their grape vines. The food was beautiful mainly due to the freshness of the ingredients. We had greens and kipfler potatoes that had only been picked an hour or two before we were eating them, the hard boiled eggs in the potato salad were fresh from the chook pen and the sourdough bread that they served with runny Brie was made by my Dad using their own sourdough starter. Nice though these ingredients were, the rich, red freshly grown tomatoes were definitely the stars of the meal. My son, who has never been a fan of tomatoes, was urged to try some and quickly became a convert, I even saw him going back for a second helping. Full of flavour and generously sized they were nothing like the awful tomatoes that are grown commercially. Knowing that we are urban dwellers with limited growing space Mum and Dad are always generous with their homegrown vegetables and herbs. This time was no exception. I received a large quantity of tomatoes along with some fresh basil, zucchinis and cucumbers. Mum had even potted up some of the herbs that we didn’t already have in our pot garden downstairs, for us to take home. 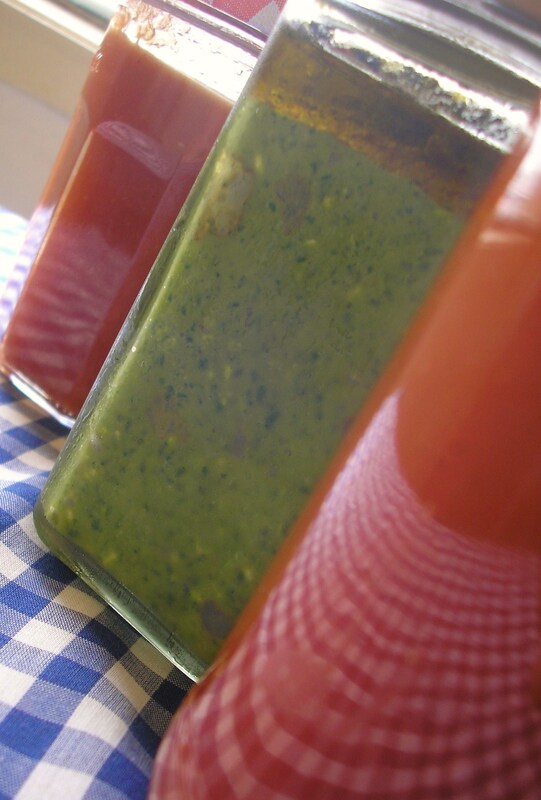 I didn’t want to waste anything so I made tomato sauce (Mum’s recipe) and pesto. Roughly chop the tomatoes and place in a large pot. Add all the other ingredients. Bring to the boil and simmer gently with the lid off for 3 hours. Stir occasionally to make sure the sauce doesn’t catch on the bottom of the saucepan. Cool. Pass the mixture through a sieve or a mouli. Return to the saucepan and bring to the boil. While still hot ladle into clean, sterilized jars. Screw the lids on tightly. Place all ingredients in the bowl of a food processor. Pulse until they are smooth and well incorporated. Spoon into sterilized jars and top with a thin layer of olive oil. Store in the refrigerator. A relative of mine used to positively relish that fatty bit at the back of the roast chicken known as the “parson’s” or “pope’s nose”. In our house she would be very welcome to it as no-one in my family would touch it with a barge pole. Everyone at our place likes the breast and it is only recently that I have been able to convince people to try a leg or a bit of thigh meat. This is frustrating as it often means quite a lot of the bird is wasted. To stop this waste I now make stock from the left over carcass and the wings, storing it in the freezer in containers until required. With a roast chicken I always serve plenty of baked vegetables. These vary according to the season but one constant is potatoes. 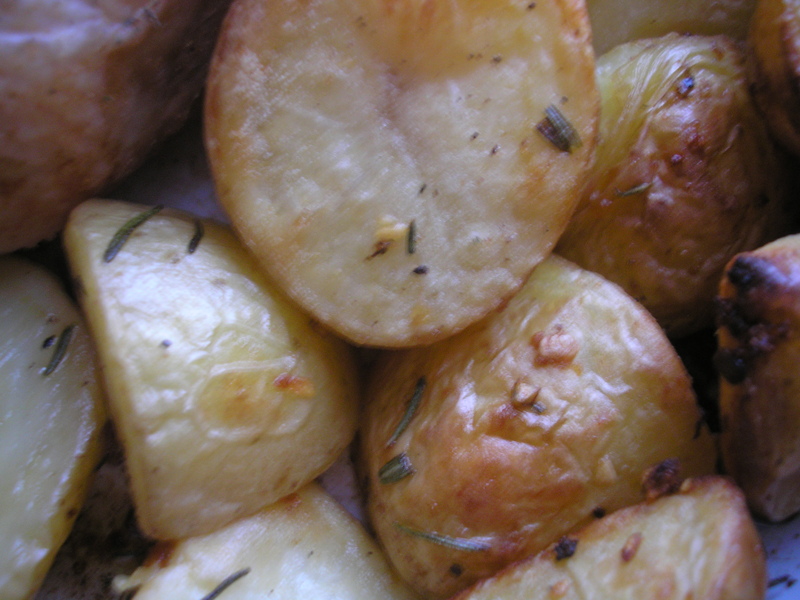 There are various schools of thought on how to make the perfect roast potatoes. Some cooks prefer to par boil the potatoes before roasting but I avoid this as I think it leaches out a lot of the nutrition and most of the flavour. I find the way to get nice crispy roast potatoes is to use plenty of oil and roast on a high heat on the top shelf of the oven. The final thing that is essential when making a roast chicken is the stuffing. This flavours the bird from the inside so it is good to use lots of herbs and a gently fried onion along with a good grind of salt and pepper. Combine breadcrumbs, fresh basil, fresh parsley, fried onion, egg and a couple of good grinds of salt and pepper in a bowl. Mix well. Place the chicken on a rack in a large baking dish. Fill the cavity with the breadcrumb mixture. Gently loosen the skin on the breast and stuff some small pieces of butter under the skin, rub the whole bird with olive oil (if you wish you can omit the butter but it does help to keep the breast moist). 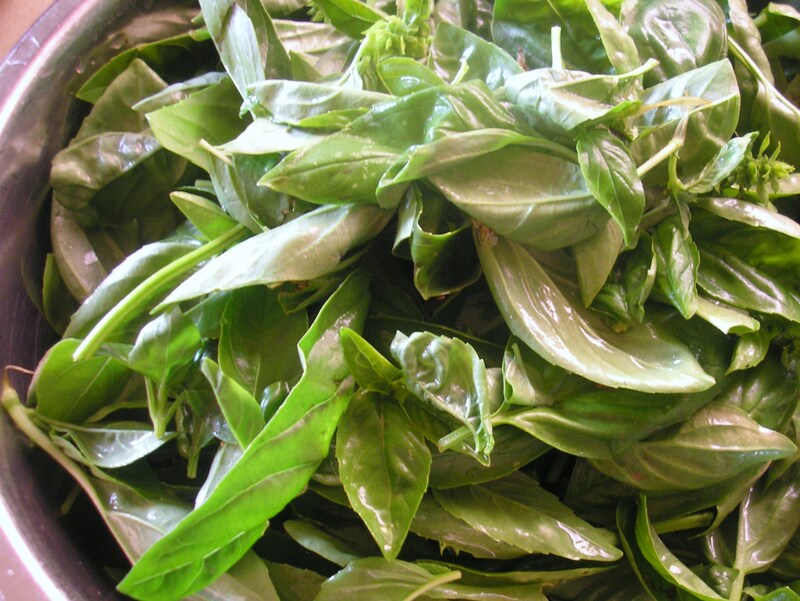 Season all over with salt and pepper and sprinkle with the dried basil and paprika. Place on the second shelf of an oven that has been heated to 200 c. Cook for half an hour, turning once. Cover with foil and cook for a further half hour. Turn the chicken and move it down to the third shelf of the oven. Cook for a further 45 mins, removing the foil for the final 15 mins. 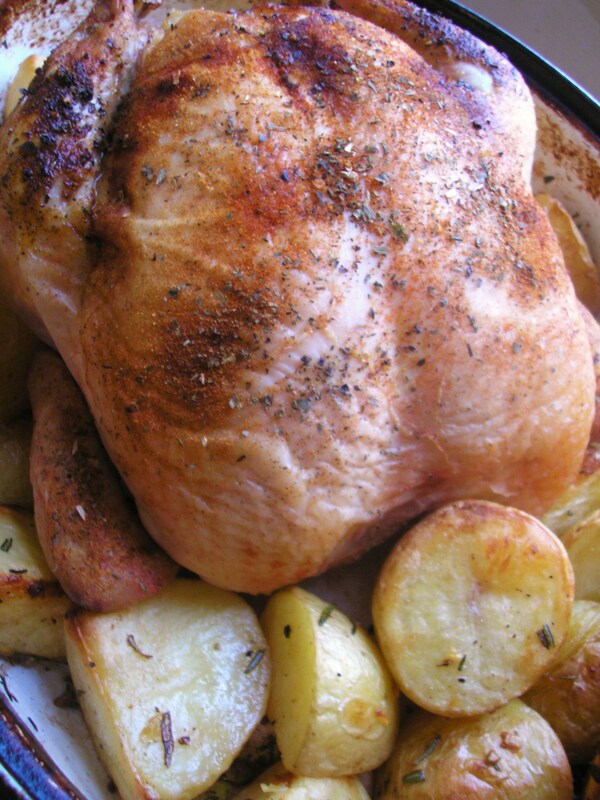 Remove from oven and pierce the skin between the leg and the breast. If the juices run clear it is cooked. Place on a plate and cover again with the foil. Allow it to rest for at least 15 mins. Carve and serve. Peel the potatoes and chop them into four pieces depending on size. Try to make sure all your pieces are of a fairly even size so that they will all cook at the same rate. Put some oil in a baking dish. Place the potatoes in it and move them around until they are all coated in the oil. Season well with salt and pepper. Sprinkle the garlic and rosemary over the potatoes. Drizzle over a little more oil and add some small pieces of butter (if using). Place on the top shelf of a 2oo c oven. Cook for half an hour, shaking the pan occasionally to make sure none of the potatoes are sticking. Remove from oven and use tongs to turn all the potatoes over. Return to oven for a further half hour or until soft when pierced with a fork. Pan gravy is not difficult to make. Remove chicken and rack from baking dish. Drain off some of the fat, leaving some to make your roux. Place pan on a low flame, add a small piece of butter, when melted add a tablespoon of flour. Stir until you have cooked off the floury taste, usually about one minute. Gradually add small amounts of chicken stock, stirring all the time. As the gravy becomes smooth you will be able to add the stock a little faster, keep stirring until you have added 1/2-1 cup stock. Season really well (gravy loves salt and pepper). Add any juices from the chicken. Allow to simmer for five minutes or until you reach your desired consistency. Pour into a gravy boat. 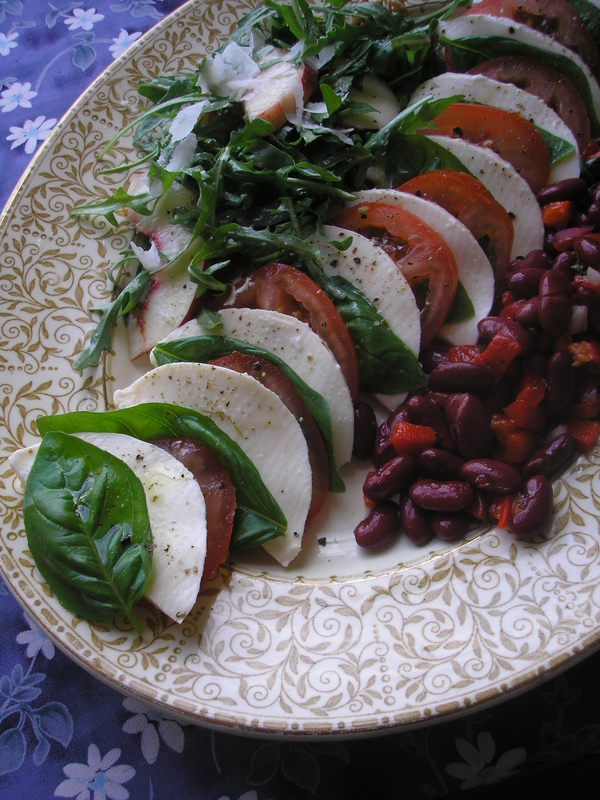 The first salad I made was the very simple Insalata Caprese. 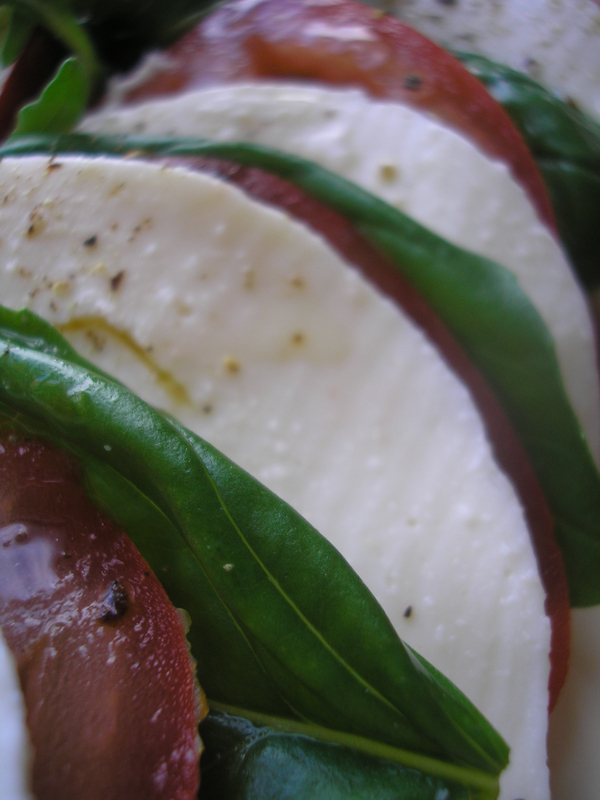 This is just slices of the best tomatoes you can find, layered with slices of fresh mozzarella and basil leaves. I ground a little sea salt and black pepper over it and finished with a drizzle of olive oil. This salad is all about the freshness of the ingredients so it can only be made in summer when tomatoes and basil are at their best. 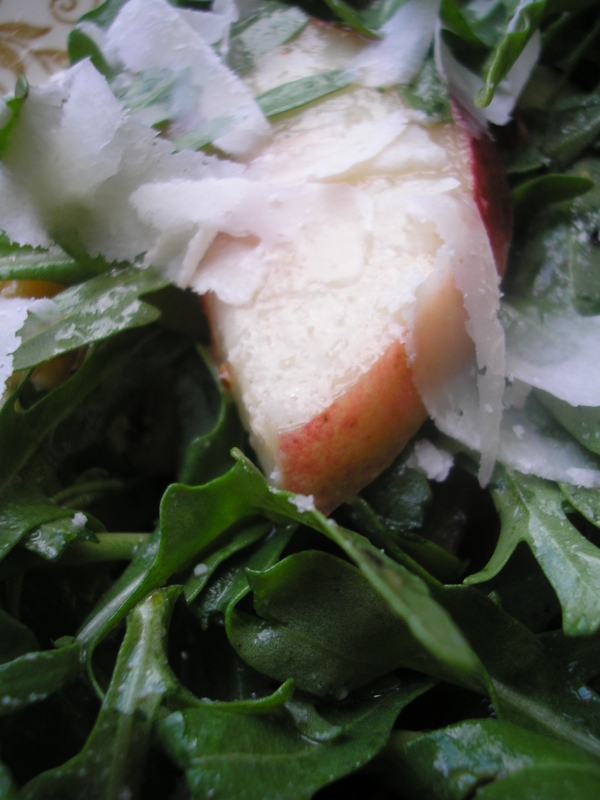 The next salad was a version of pear, parmesan and rocket salad. Unfortunately, the early William pears had not yet appeared in the shops so I substituted slices of white nectarine. Toss all ingredients together in a large bowl. Top with freshly shaved Parmesan before serving. Finally, I opened a tin of red kidney beans, added half a finely chopped Spanish onion, a few chopped basil leaves and a finely chopped roasted or char grilled red capsicum. To dress I added the juice of a lemon and a good drizzle of olive oil, a grind of sea salt and a few grinds of black pepper. Toss and serve. I place a whole red capsicum on the gas jet, as each side blackens and blisters I turn until it is done all over. I put the whole thing in a plastic bag, close it and leave it to sit for half an hour or so. Then I remove as much of the skin as I can using tongs and scraping off any difficult bits with a knife. This is a very easy way to char grill a capsicum if you don’t have a ridged grill.